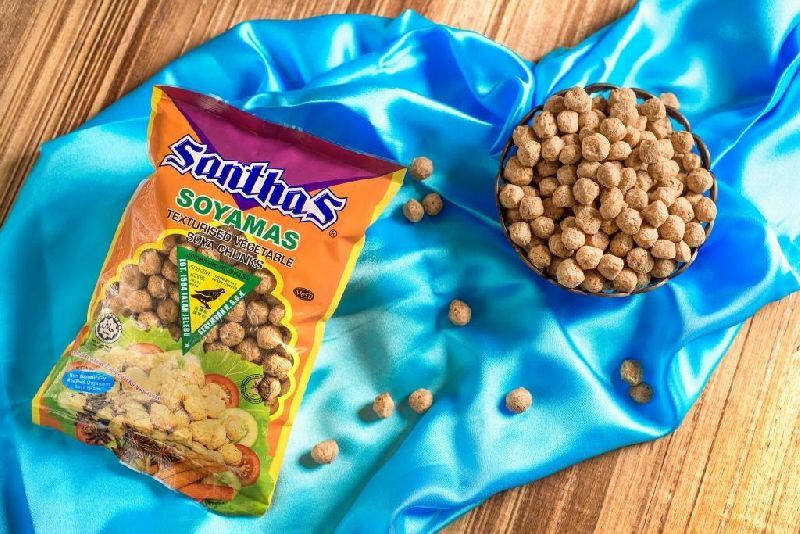 Soya Chunks is a healthy and natural soy flour product excellent for vegetarians for good source of protein diet. Soya chunks or Meal maker is a vegetarian meat or texturized vegetable soya protein made from soya product. There are many types of shapes and sizes available in Asian grocery store, chunks, flakes, nuggets, grains, and strips and sizes, exiting the nozzle while still hot and expanding as it does so. It doesn’t contain any flavour, colouring and fragrant. Santhas soya chunks uniformly size which easy and quick to cook absorb flavors from the ingredients added to the dish. Soya chunks need to be soaked in hot water thoroughly for few minutes to soften and later squeeze the water. A mouth-watering, delicious and heart-healthy vegetarian recipe bites alternation to meat. Perfect for Indian and Chinese dishes as Spicy Chilli Stir Fry, Masala Gravy, Vegetable Manchurians, Kurma,Vegetarian Biryani, Pulav, Soya Kheema Masala, Cutlet, Malaysian dish rendang and etc. Total Ash 7.00 % Max.